Batley players celebrate their outstanding victory over Widnes Vikings. Batley Bulldogs coach Matt Diskin hailed last Sunday’s superb 20-18 over Widnes Vikings among the best performances during his time in charge. A superb defensive effort restricted Widnes to just one try playing down the slope, while Batley fought back from behind on three occasions, before Dave Scott’s late penalty goal sealed a memorable win. “It’s something we desperately needed, given our start to the year. “They had a couple of tries on our right-edge where structurally we are quite good, but they just got on our centre’s outside shoulder, which we’ll have a look at. 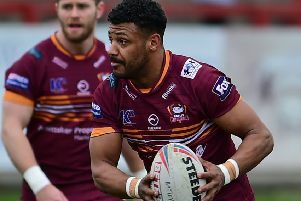 It was only Batley’s second league win of the season but was enough to move them up to 10th place in the Championship, just a point behind Dewsbury Rams, who they meet on Good Friday. Diskin added: “I think the adversity we’ve had since the start of the year has conditioned us and made us a bit mentally tougher. “We had a man sin-binned and conceded two tries and the game could easily have gone the other way, but we showed some real character and some grit to stay in the game and the boys thoroughly deserved the win. “I thought they were outstanding. Batley lost Keenan Tomlinson early on which led to Paul Brearley coming on at left-centre and he went on to have a cracking game, paying a part in two of the Bulldogs tries. Diskin added: “That’s not his natural position, but I thought he was outstanding. He was a really tough person for Widnes to handle on crossfield kicks and we did get a result from a couple of them. “It’s hard to single anyone out. I thought Dane Manning was outstanding and Danny Yates was really good. “I thought the referee made some good decisions for both teams and some bad ones as they do.